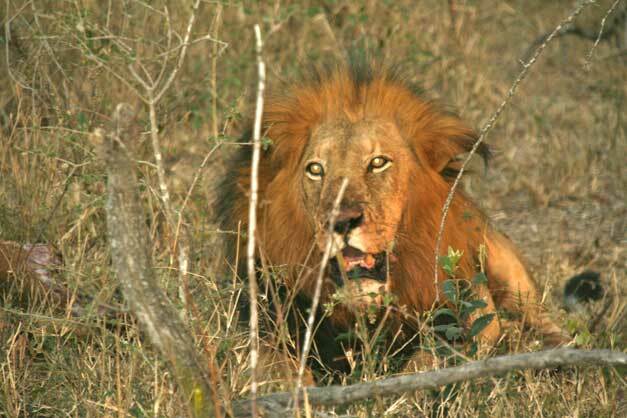 A couple of weeks ago we experienced a truly amazing sighting here at Camp Jabulani. One of the couple’s staying with us had opted to go on the afternoon elephant back safari, while the other guests preferred to go on a game drive as they’d already been on the elephant safari the previous afternoon. As soon as we’d seen the first couple safely onto their mammoth rides, we headed back to camp to prepare for the game drive. On our way back we received a radio call from a fellow ranger telling us of the most incredible sighting he’d just witnessed. He said he was coming out of a dry riverbed when he heard a commotion to his right. Looking in that direction he saw a large male leopard running for his life with a male and female lion hot on his heels. This sounded too good to pass up so we immediately called ahead to the lodge to let the guests know that we were on our way to fetch them. They’d just finished their coffee when we arrived and quickly rounded up their belongings. The action had taken place not too far from the lodge itself, so within minutes we’d located the large cats who were by that point lying next to an impala kill trying to catch their breath. We figured out that the leopard must have caught the buck and been in the process of dragging his kill up a tree when the lions arrived and chased him off. We’d been at the sighting for just a few minutes when something grabbed the male’s attention. He stared with intent at the direction the noise had come from, and then without warning he took off like a shot in the direction of his focus. We tried to follow him but he disappeared so quickly that we couldn’t keep up. Our only guess was that the leopard had probably returned to the area to see if his kill was still intact, only to be chased off a second time by the intimidating thug. 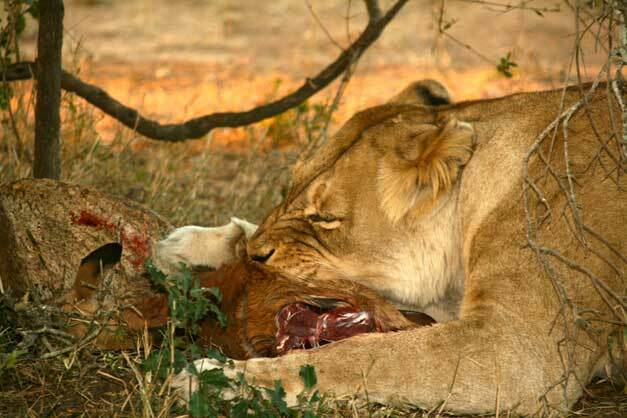 On returning to the kill we found the lioness taking full advantage of the male’s absence and happily feeding on the impala kill. He returned a little quicker than she anticipated however, and seeing her tucking into “his” meal literally stopped the big cat dead in his tracks. He looked at her indignantly for a moment, and then charged straight at her. The lioness tried to stand her ground but she was no match for the much bigger male. In the end all she could do was lie down by herself and listen as her greedy counterpart devoured the rest of the carcass. Click here to see a short video of the lion chasing her off the kill.